Researchers determine the effects of replacing glucose or sucrose with fructose on glucose, insulin, and triglyceride concentrations. When you think about eating healthier, what do you think about limiting in your diet? Sugar? Carbohydrates? Both? Over the years, sugar has gained a bad reputation. The “bad” sugar that usually comes to mind is sucrose, commonly known as table sugar. However, there are two other types of sugars: glucose and fructose. Glucose and fructose are referred to as simple sugars because they are made up of single sugar molecules. Joined together, glucose and fructose form sucrose. 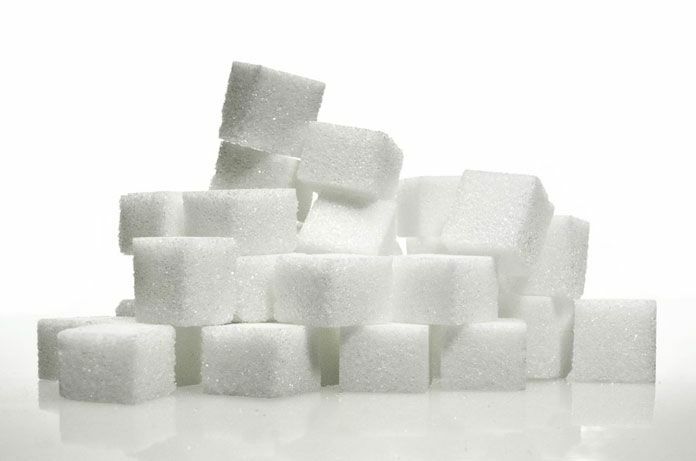 Our bodies break down sucrose into the simple sugars glucose and fructose. Glucose, our body’s preferred energy source, is often referred to as blood sugar because it circulates in our blood. When we eat, our body breaks down sugar and carbohydrates into glucose for energy. Our bodies can either use glucose immediately, or store it muscle or liver cells in the form of glycogen for later use. Fructose is a sugar naturally found in fruits and vegetables. It differs from the other sugars because our bodies process it differently. Fructose is not our body’s preferred energy source and unlike glucose, it does not cause insulin to be released. Our bodies need the hormone insulin so that glucose can be taken up into our cells for energy. Individuals with diabetes either don’t make enough insulin, or their bodies do not respond properly to the insulin that is produced. In some cases, it is a combination of both. In type 1 diabetes, which usually begins in childhood, the body attacks the insulin producing cells of the pancreas. Type 2 diabetes, on the other hand, most often affects adults and is characterized by insulin-resistance and sometimes low levels of insulin production. Both types of diabetes impair the body’s ability to take up glucose. Glucose then builds up in the blood. High levels of blood glucose (hyperglycemia) can damage blood vessels in the heart, kidneys, eyes, and nervous system. If it is left untreated, diabetes can lead to heart disease, kidney disease and stroke, among other conditions. What happens when we replace sucrose and glucose with fructose? Type 2 diabetes may be hereditary, but it is also influenced by our lifestyle and diet. Because of this, public health campaigns encourage people to maintain a healthy weight with proper nutrition and regular exercise to prevent type 2 diabetes. Many have considered replacing glucose or sucrose with fructose in food and drinks, but what are the effects of this replacement? Previous studies have yielded conflicting data on the effects of fructose in diabetic patients. A previous study suggests that fructose might raise triglyceride (form of fat stored in the body) concentrations higher than glucose or sucrose after meals, and could thus worsen or contribute to the development of diabetes. What are the effects of replacing glucose or sucrose with fructose in those with diabetes? What are the resulting glucose, insulin, and triglyceride concentrations? A recent study published by the American Journal of Clinical Nutrition sought to answer these questions by reviewing the evidence from past studies. To do so, researchers searched databases for studies that measured the presence of blood glucose after a meal in which glucose, sucrose, or both, had been replaced with fructose in equal amounts. They included randomized controlled trials in healthy adults or children with or without diabetes. They also included studies on lean, overweight, and obese populations. A total of 47 individual studies were included in the final analysis. The researchers combined the findings and performed a meta-analysis using statistical methods to analyze blood glucose, insulin, and triglyceride concentrations after meals. The researchers found that replacing glucose or sucrose with fructose resulted in significantly lower blood glucose and insulin concentrations after meals, particularly in people with prediabetes and type 1 and type 2 diabetes. Surprisingly, triglyceride concentrations did not significantly increase. These findings signify the potential benefits of glycemic (presence of glucose in the blood) control when substituting glucose or sucrose with fructose in equal amounts. And since previous studies have found that blood glucose control is strongly-associated with an increased quality of life, the researchers note that this benefit alone may justify replacement with fructose. Since overweight individuals were also found to have a greater reduction in blood glucose after meals, it indicates the applicability of replacing fructose for glucose or sucrose in overweight populations. The study concludes that although it may not be possible to completely replace sucrose or glucose with fructose, the replacement could be achieved by replacing sucrose or glucose with fructose in recipes and choosing premade products rather than glucose or sucrose. Evans RA, Frese M, Romero J, et al. Fructose replacement of glucose or sucrose in food or beverages lowers postprandial glucose and insulin without raising triglycerides: a systematic review and meta-analysis. American Journal of Clinical Nutrition. 2017 June 7.